Address: Alcalde Jose de Armas, s/n, Agaete (Gran Canaria), Islas Canarias. 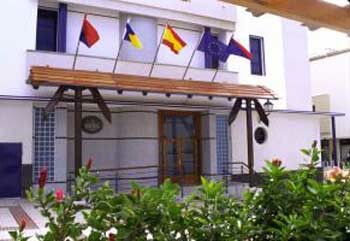 In the picturesque town of Agaete, this hotel has a subtle nautical theme and a fantastic spa to enjoy. Head down to the nearby beach for breath-taking scenery and a swim in the Atlantic Ocean. After a day exploring the island, head back to the Puerto de las Nieves Hotel for a circuit in the spa. Here, you can massage away your aches and pains under the water jets, unwind in the bubbling Jacuzzi and kick-start your circulation with the contrasting pools. Relax with friends in the inviting lounge area where you can also browse the free, wireless internet. Then head to the restaurant and bar for a pleasant evening with tasty, local cuisine. The Puerto de las Nieves is located in a pretty seaside village with typical Canarian architecture. White houses have blue roofs and there is a calm atmosphere among the local community. The Puerto de las Nieves is on the ferry route to Tenerife should you wish to take a daytrip to the neighbouring island. Please inform Hotel Puerto de Las Nieves in advance of your expected arrival time. You can use the Special Requests box when booking, or contact the property directly with the contact details provided in your confirmation. Guests are required to show a photo identification and credit card upon check-in. Please note that all Special Requests are subject to availability and additional charges may apply.